This MOD allows an user to have a custom rank name and image (from the uploaded rank images). 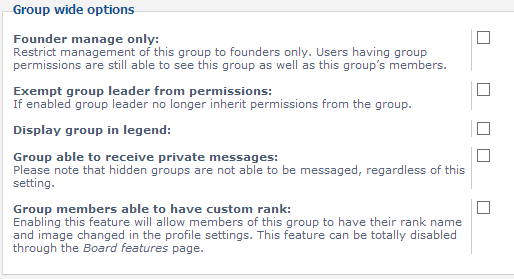 However, for an user to be able to have a custom rank, he must be part of a group that has this feature enabled and the MOD has to be enabled board-wide in order to be used. You can also decide whether the user should be able to switch the rank text and image, or the text only. 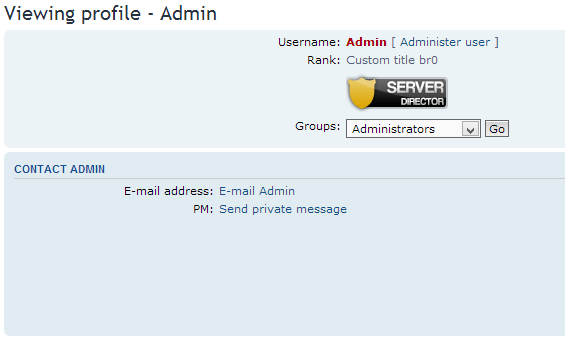 Have the custom title displayed in: topics, memberlist and profile page. Green means feature is finished; Orange means feature is unfinished or awaits development. Last edited by Dugi on Wed Aug 05, 2015 11:16 am, edited 10 times in total. The war to be continues. Thanks a lot for the feedback guys. I'm almost finished with the pending features. You are all welcome to suggest features! I'll post up a link soon so you can help me find bugs, typos etc. Seems like a great MOD. well done Dugi. Updated. Download link added; Now you're able to check the MOD out if you like. hi the images links it seems dead. Meis2M wrote: hi the images links it seems dead. Is this going to be updated for 3.0.12? I am the almighty Furball Zen. Hear me fluff. Can I allow custom ranks (text) per group but NOT custom badges (images) per group? You can also decide whether the user should be able to switch the rank text and image, or the text only.